Batman is always a visually appealing character. Not only does he have a sweet costume, but he also snatches up the best artists in the industry to draw said costume. Greg Capullo has taken an issue off and #44 features Jock as a special guest artist. How well did he do? Well, Jock is a god among men. That’s the only way to describe his excellence. Jock has worked on Batman titles before and it has always given quality work, but this is on a whole other level. For starters, Jock has a way of presenting Batman in unique ways. One particular scene shows Batman removing his cape and using it as a vicious weapon, this puts Bruce in different stances and allows Jock to improvise. He also has a knack for the abstract as demonstrated in the blending of newspaper articles with the skylines of Gotham. Pages like these should be in an art gallery. It’s nice to be reminded that Batman can be so much more than an icon for a corporation. Written by Snyder and Azzarello, the story is obviously in good hands. Issue 44 acts as a one-shot that easily interlaces into the current story arc. The Gordon version of Batman is missing, but things tie into his current standings. Taking place right after the events of Zero Year, Bruce is still learning the ropes and getting his feet wet as a detective. By the end of the issue, events connect together and the story is shown to be a little bit of an origin story for Mr. Bloom. Bloom’s origin grows (ha) out of the story of a young gangbanger that was recently murdered. Batman takes the case personally and is angrier than usual. The storyline also take a very modern and political slant. It’s an intriguing way to update Batman for today’s hectic political climate. How would Bruce react to a dying middle class and an increasing gap between the poor and the ones who have everything? These are very serious questions that Bruce has to contend with; they’re also things that further fuel his rage and frustration. 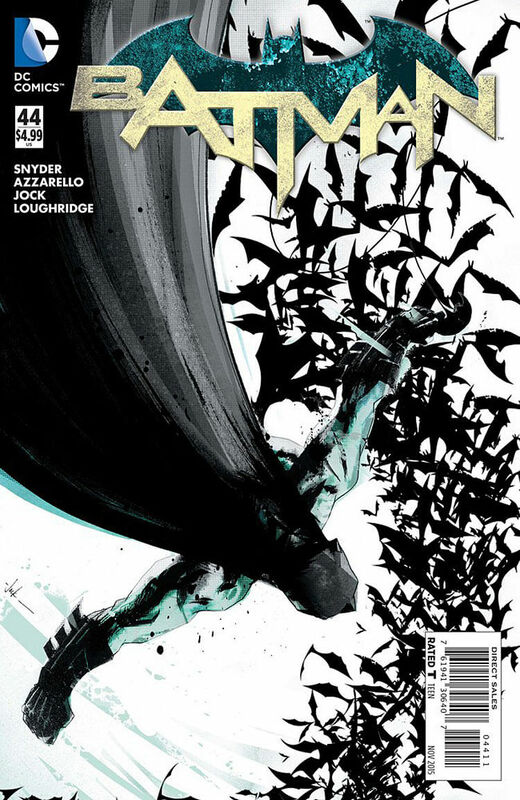 It’s really not hyperbole to say that this is one of the best Batman issues in years. This is more than likely the best issue in Snyder’s run and probably the best Batman comic since Morrison’s RIP. It’s actually kind of friendly to new readers, so you really have no excuse to miss out on such a true gem.